Major Nelson showed off over the weekend a bit of what we can expect during the next Xbox One update, and there's a lot to look forward to. If you're heavily engaged in the social aspects of Xbox One, this update is for you. The activity feed is getting a pretty big overhaul. The feed is being revamped into a single-column list that is much longer and includes more of the content gamers have requested from Microsoft. The feed reminds me a lot of Twitter. 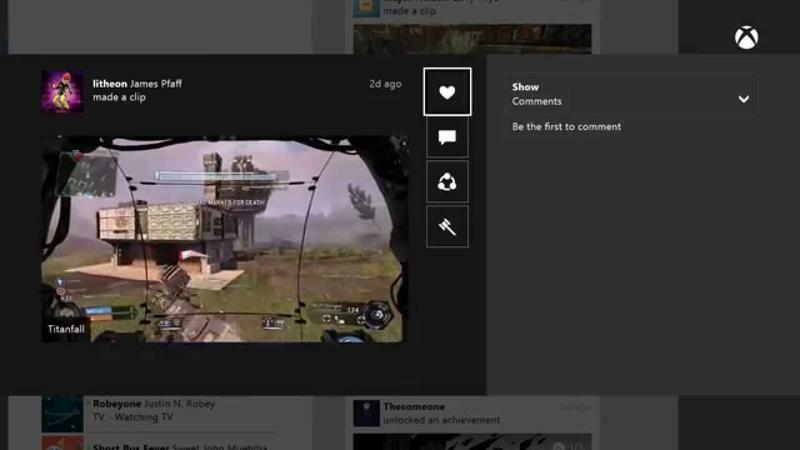 You can also share, like, and comment on game clips via the activity feed and Upload Studio app. You'll be able to see when friends were last online when looking at your friends list. Mobile purchasing is finally coming to Xbox One. With the August update, you'll be able to purchase games and game content via the SmartGlass app or Xbox.com and, if you use the Xbox One's 'instant on' feature, the content will automatically download for you. A few notification changes are coming as well: Not only is there that low battery indicator in the corner of the screen added a few months back, but now when your battery is getting low, a notification will pop up letting you know so that you can pop in a new set of batteries between matches instead of ending up stuck like a sitting duck outside your Titan. Finally, Major Nelson gave us a preview of a feature that won't be part of the August update. Coming in a future update is the Friends tab, which will show you your friends' most-played games, a leaderboard, and friend activity. This feature will apparently be available only to preview users indefinitely until Microsoft feels they have it just right for a full release. This update doesn't, unfortunately, include any of the adjustments to account for Kinectless Xbox Ones we were hoping for, but the update is meaty all the same. Mobile purchasing and the low battery pop-up are both features I'm looking forward to using when the update goes live.